The holidays are approaching and what better way to celebrate than with friends, family, and a little bit of gluttony. As satisfying as it sounds to give into our temptations, overeating during the holiday season can be detrimental to our waistline and blood sugar levels. 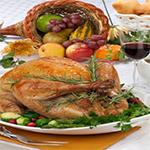 According to the National Institutes of Health, holiday eating can result in an extra pound or two each year. Over time, holiday weight gain can add up, which can increase risks for complications from diabetes. Fortunately, caving into a voracious appetite over the holidays can be avoided by following a few easy steps. Almased offers ways to help people with diabetes avoid weight gain and to keep blood sugars at healthy levels while still enjoying your holiday meals. Don’t be a meal skipper. With all the festivities happening around us it is easy to miss out on breakfast, the most important meal of the day. Recent research of brain scans of 21 people, presented at the Neuroscience 2012 conference, revealed that people who missed out on breakfast were more likely to seek out fatty and high calorie foods later in the day. (1) If you’re prone to skipping meals, having an Almased meal replacement first thing in the morning can help keep your cravings for fatty and high calorie foods at bay. Eat with your stomach and not with your eyes. Be mindful of when you feel satisfied and know when enough is enough. Saying no to that extra helping can save you from not only overindulging on calories and carbs, but also from increased insulin resistance that can lead to weight gain. New animal research from Mount Sinai School of Medicine shows overeating impairs the ability of brain insulin to suppress glucose release, resulting in higher insulin levels in the body. (2) Limiting yourself to one plate of food without overfilling it and eating slowly, savoring each bite of food can help you eat more consciously. Almased recommends having 1/2 a shake of Almased before a big meal to lessen the temptations of overindulgence. Plan ahead and remember your alternatives. Know where you’re headed and what you’ll be eating. This can help you adjust medications if necessary and to find ways to substitute high-carb and high-fat foods with more favorable ones ahead of time. Knowing what foods are lower in glycemic index and higher in fiber can help you make healthier choices come mealtime. Also, bringing with you an exchange list for starches, fats, and sweets, desserts, and other carbohydrates can help you carb count meals to keep your carb intake at an acceptable range. Almased’s Diabetes Figure Plan provides pre-counted carb recipes, perfect for any occasion.